So I've recently been laid off and have a lot more free time so I've really dived into picking as a way to occupy my mind. I've been doing it for several hours a day for about a month, and I'm frustrated to discover that I've gotten repetitive strain injuries in my index finger, thumb, and a bit of my wrist. This was my original position. The acute concave angle of my index finger from gripping the thin pick and sliding it back and forth strained the muscle I think. And the thumb at the base also, as I slid the pick back and forth across the tip of the middle finger. 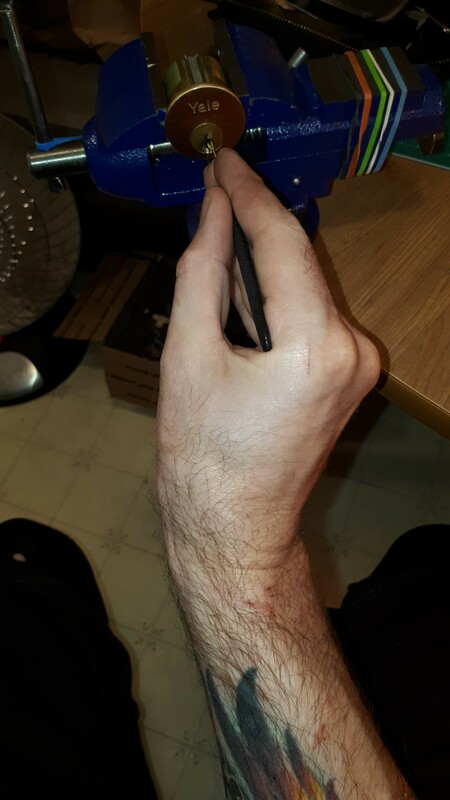 I had tried to approach the vise from the side so as to minimize the angle of the wrist, but it resulted in gripping harder with my index finger. Next I tried approaching head on while keeping the index finger straight to prevent further injury, but this drastically increased the angle of the wrist which is uncomfortable, although even when I tried to keep the wrist straight I'm still experiencing aching in it. So what position do you guys use? Do you slide the pick along your middle finger using your thumb and forefinger or do you move your whole hand as one unit? How do you brace the pick? What is your angle of attack? What's your wrist angle? Can you show pictures? I'd really like to know how to do this without injuring myself, I'm very frustrated at not being able to do it for probably 2 or 3 weeks while I recover. I must be doing something wrong because people play piano and guitar every day for years without injuring themselves. Re: Best picking position for ergonomics? It would seem that you increase the injury risk anytime you don't mix it up occasionally. Repetitive motion is responsible for lots of problems. Change it up a few times a day and you will be ahead in the long run. You will be able to pick no matter what the angle. Marathon sessions of any thing are usually unhealthy. I think many, if not all of us can relate. 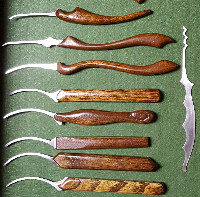 I'd imagine even those of us with very strong hands/wrists/forearms quickly realize that lockpicking strains a very different set of muscles and tendons that simply are not used on a daily basis. Just as with anything, eventually the body adapts and we'll experience less pain and have more stamina. But in the meantime(! ), delays in practice are frustrating, and the concern of actual damage, real. Grip: This is really gonna vary from person to person. As you watch videos you'll see a whole array of different styles. What might be comfortable & productive for one person may be nearly impossible for the next. The 1st grip you show - I could really see getting to you over time. The 2nd grip I would say is fairly close to how I tend to pick. The thumb sets on the side of the handle while the index finger rests on the top edge of the handle. Tip of the middle finger sets on the face of the lock and alongside the shank of the pick, acting as a guide. As I say, damn near what you've shown in that photo. Sometimes when we're SO intensely focused (or frustrated, lol), we might unconsciously tighten our grip more and more and more - but in reality, a fairly loose hold is all that's required. Maybe simply becoming more aware of this will help you tremendously. And remember, it's all about 'lever-action' - simply bringing the handle down in order to bring the working end up. The fulcrum point of this lever action is usually the keyway itself. But when that's not possible, the tip of the middle finger might serve as this point. Wrist: Yeah, definitely experiment a bit to tryn' get the kink out. As you've already tried and mentioned, moving slightly to the left I find is helpful. Moving the lock up or your body down could also help. Or, avoid moving either, and achieve the same thing by playing with the angle of the vice or the lock. i.e. Angle the face of the lock more upward to point at your head (if that makes sense). Mastersmith makes a great point... mix it up from time to time. Not only for the sake of your hands, but for versatility (which real-world picking involves). Picking some padlocks in-hand is a great way to get away from the vice-mounted locks for a bit (which can also give your body a break too). Not to mention, there's just such a wealth of fun to be had with padlocks anyway. Lastly, something you might possibly consider HERE. Personally, I reeeeally feel the time & effort worthwhile. This has helped me tremendously! Certainly in terms of health... but I also truly believe I've gained more control over my hands. To be honest, I've been slacking a little recently. But I'll be getting back into a more all out full routine again soon. Keep at it! Enjoy! Don't hesitate to ask more questions. And post some accomplishments along the way! We'd all love to see.